This Boone Trail Highway marker is an arrowhead formed by rocks and masonry that has been coated with cement to form a smooth surface. It has a Style-2 Boone Highway tablet, an Old Plank Road plaque and Buffalo Trail tablet. The steel Style-2 tablet was first seen in 1919, used through 1926 and distinguished by the BOONE TRAIL HIGHWAY caption being in block letters. It holds an image in relief taken from Alonzo Chapel’s 1861 illustration of Daniel Boone and his hunting dog. The Old Plank Road plaque is unadorned aside from the inscription and is one of several placed along with Boone Trail markers. The third tablet was cast in the shape of a Buffalo with the word TRAIL along the bottom. 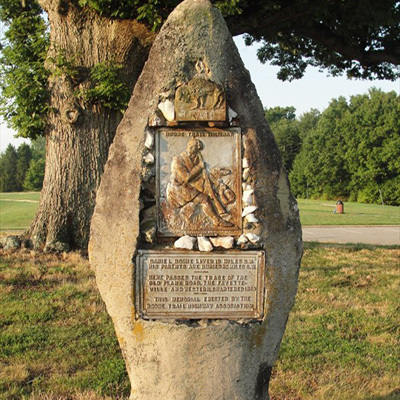 The Buffalo sculpture on this marker is different in style to those produced later when Rich announced plans to mark old Buffalo Roads and Indian Trails across the state. Those plaques were square with the word ROAD across the bottom. This Boone Highway marker was numbered 52 by Everett G. Marshall. His interest and research of the markers led to the book, Rich Man, Daniel Boone. The numbering system was simply the order in which he found or became aware of a marker. Plank Road Plaque: DANIEL BOONE LIVED 18 MILES S.W. / HIS PARENTS ARE BURIED 25 MILES S.W. J. Hampton Rich presented the marker. Professor R.T. Hedgecock, principal of Jack’s Temple school which once stood on this site acted as master of ceremonies. The marker is located on Old US 311 (High Point Rd.) near Union Cross Road at Union Cross Elementary school, Forsyth County, NC. The marker sits on the grass, inside a chain link fence that surrounds the school grounds, near the parking lot. A very large shady tree stands behind the marker.